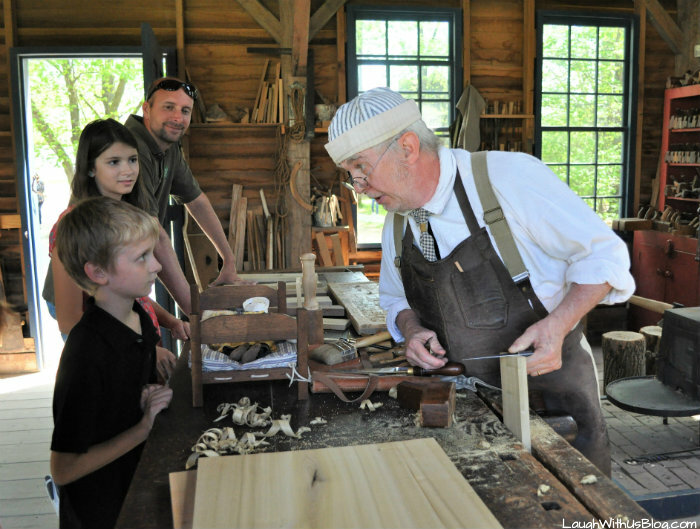 Step back in time and experience life as it was in the 1800s at Conner Prairie in Fishers, Indiana near Indianapolis. Fun for the whole family! 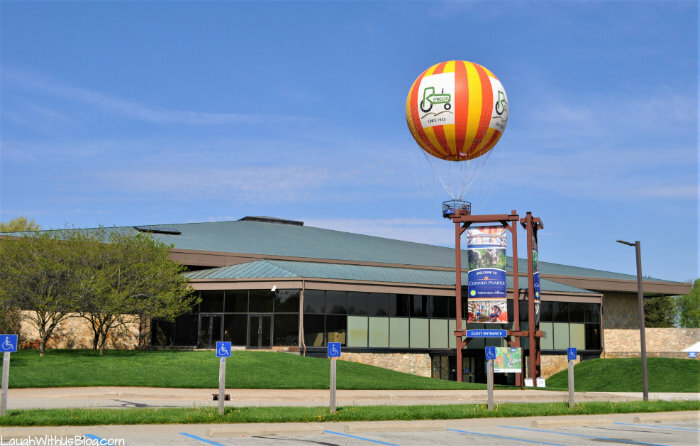 Conner Prairie is a Smithsonian affiliate and one of the most visited outdoor museums in the country! Many thanks to Conner Prairie for hosting our family for a day. All opinions are my own. 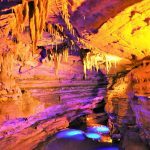 As one of the largest attractions in the area Conner Prairie is well worth the visit. Plan to spend the day! 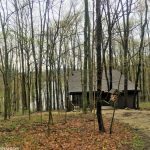 Explore nearly 1,000 wooded acres. 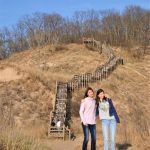 We enjoyed hiking many of the trails and wished we had time to explore more. 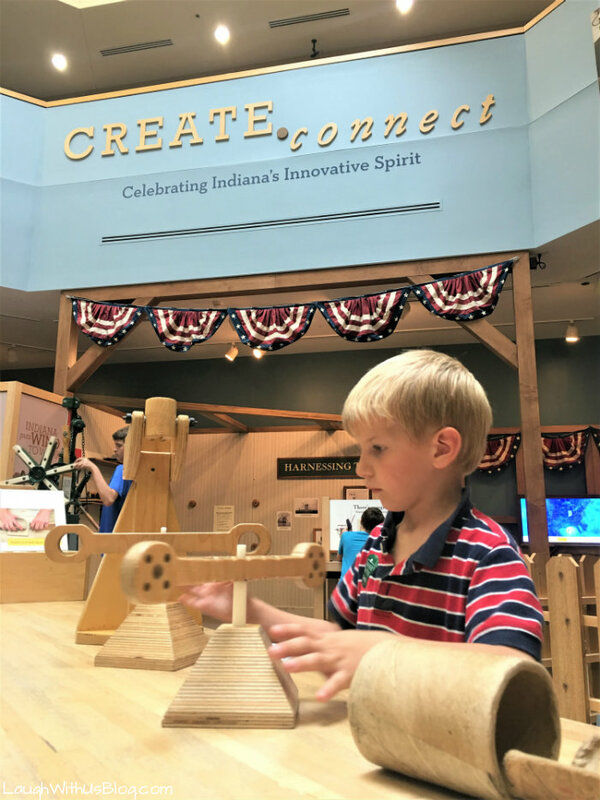 Enjoy hands on experience of Indiana’s history through historically themed attractions, and find learning spaces that combine history and art with science, technology, engineering and math in ways that kids will enjoy and learn at the same time. Below I will walk you through how we spent our day. 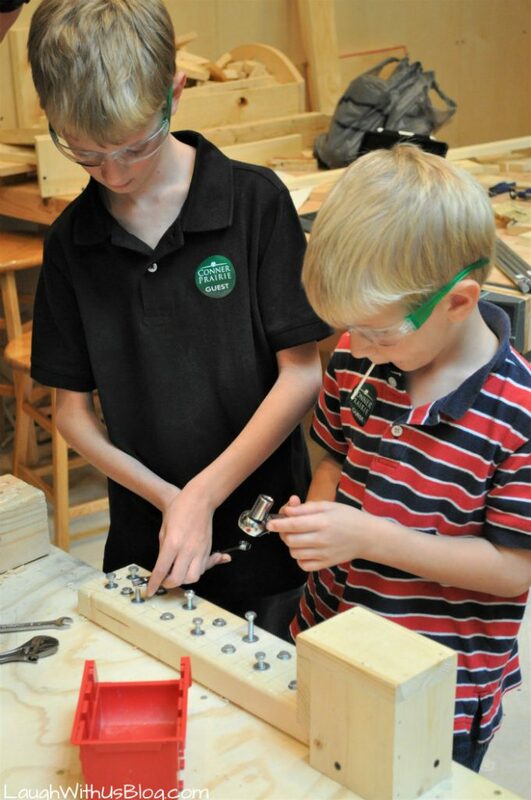 What kid doesn’t want to swing a hammer, drill a nail, and saw wood? Even my big kids enjoyed working with their hands. We had to drag them out or we wouldn’t have time to see everything. 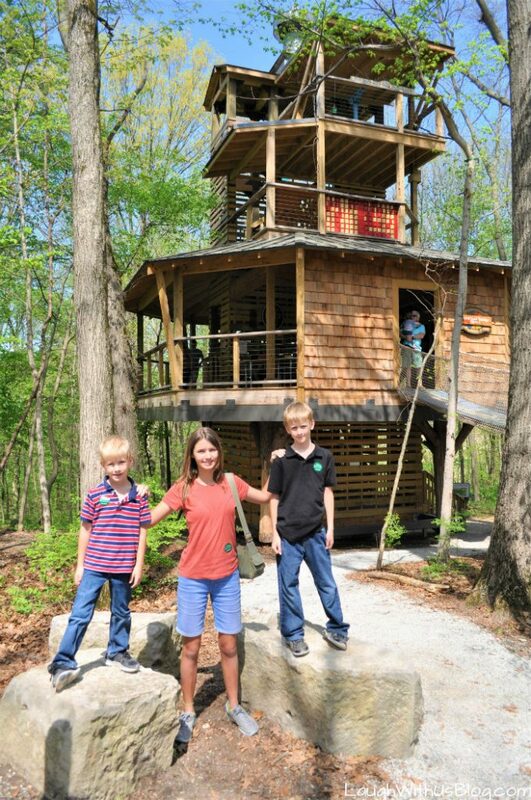 Treetop Outpost is a kid’s ultimate dreamland. 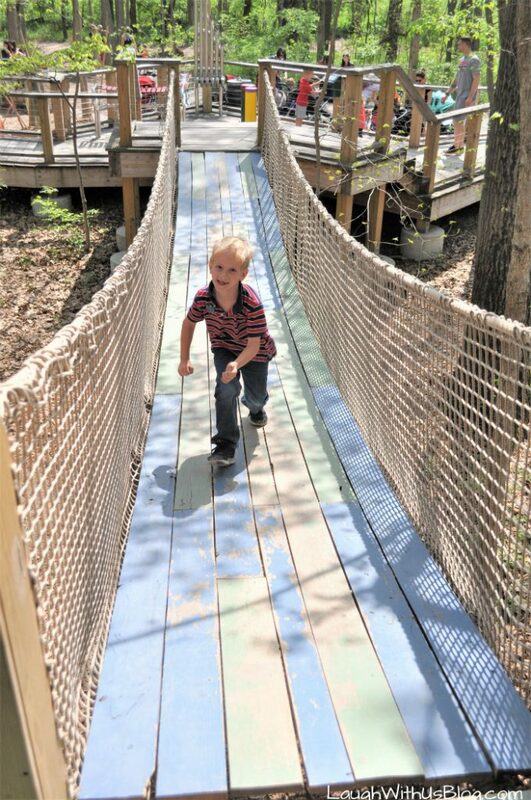 Play in a 4-story treehouse and surrounding play areas. My boys thought this hanging wooden bridge was super cool. They ran back and forth, and I watched them with glee! I love seeing my boys living is up outside. As good as music is for kids I can’t stand them playing instruments inside. 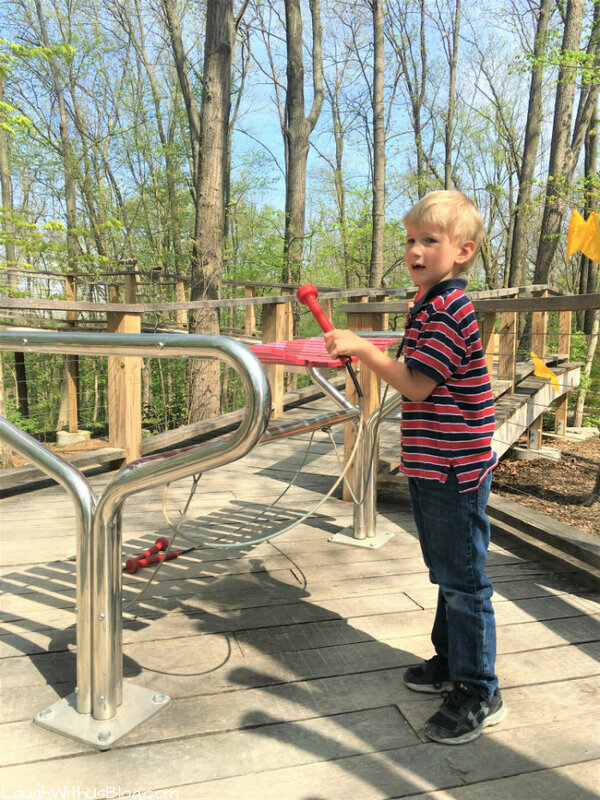 The great outdoors soak up the cacophonies created on these fun instruments so they could pound to their heart’s content. 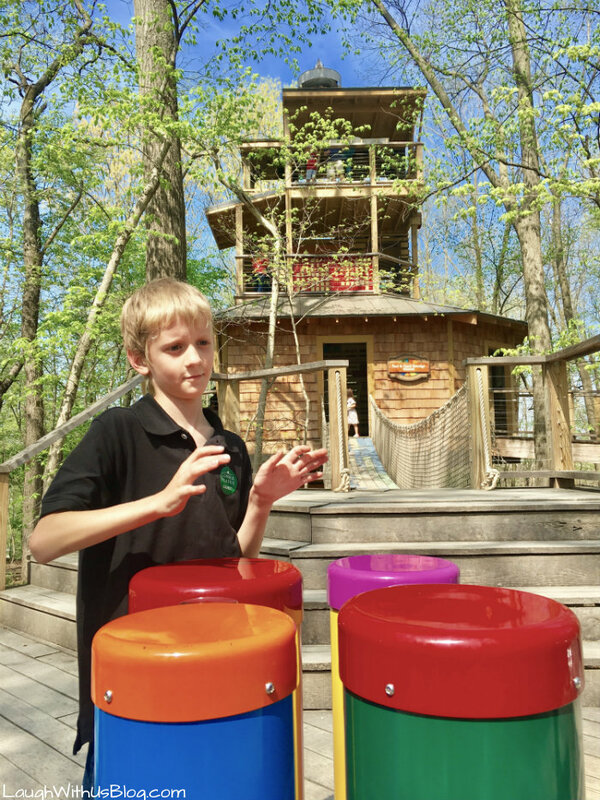 The Treetop Outpost was my two boys favorite attraction at Conner Prairie. Once they arrived here they would not have left. I noticed local moms have a membership and bring their younger kids often to this area to play. Try your hand at old time candle making. We realized this takes great patience! Meet the residents of Prairietown as they go about their daily lives. They literally stay in character respond with commical disbelief and questions when you speak of things that weren’t available in the 1800s. We got a real kick out of if. Learn new skills and come prepared to learn and play. 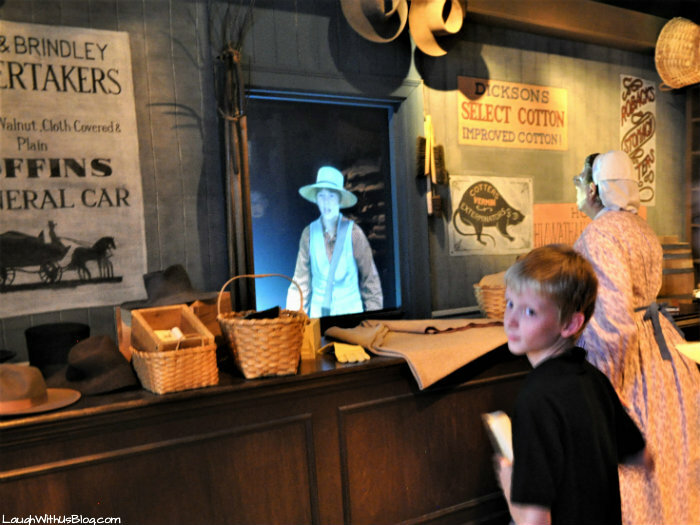 The 1863 Civil War Journey was the favorite attraction of most of the older kids as well as my husband and I. On July 8, 1863 Confederate General John Hunt Morgan and his forces crossed the Ohio River into Indiana. You will cross a covered bridge and step into the town of Dupont just after this raid. You will be immersed in the history as you enter the store and the events begin to happen while you are there. It was all very exciting for everyone! These were the activities that took most of our day at Conner Prairie, but there is so much more to do. 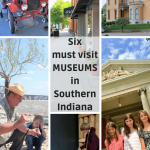 Ride a hot air balloon, pet the animals, see the William Conner House and so much more. For more information and to plan your visit click over to the website here>>>> Conner Prairie. 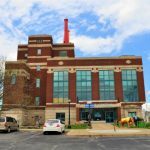 This looks like such a fun museum for the whole family! Outdoor/living museums really immerse you in a unique way . . . it’s so cool to experience living in another time. It really does immerse you in a unique way that you would never have experienced or understood the history! That looks like so much fun! This is the kind of place I’ve always loved to take the kids. It really makes learning interesting. The best way to learn! Thank you, Stacie! My grandma is a member of the Conner family that originally moved to Detroit in the 1700s. Conner Avenue and Conner Creek are named after the family within the city. 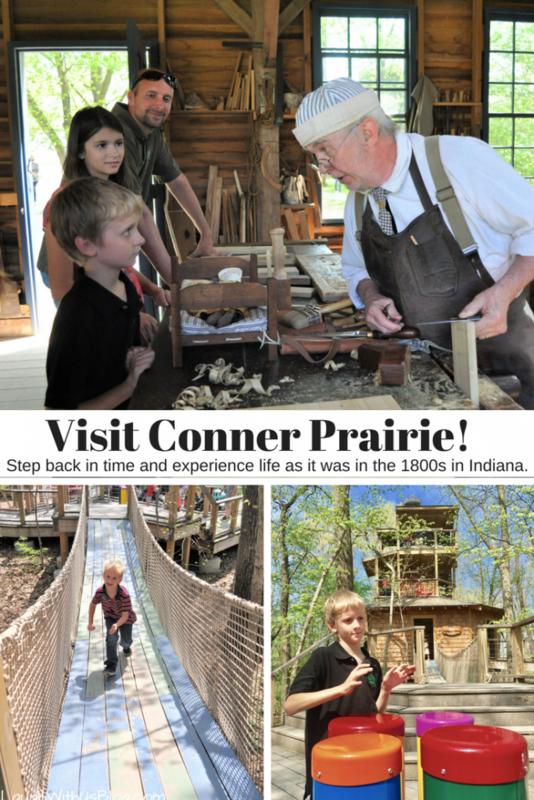 Conner Prairie was the homestead for some of the family who later ventured off from Michigan to settle in Indiana. Been there a few times to check out the historical village they’ve made out of the place and have been impressed. 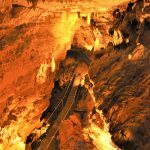 A nice place to visit for a family road trip! How amazing to be able to visit your own family history in this way! I love going to places like this. I remember doing it as a kid and the candlemaking was always my favorite. My kids love places like that. If we’re ever in the area, we’ll have to stop by. WOW! This looks like so much fun. I have never been to Indiana but do have a goal to visit every state ….bucket list right? My son would have a blast with all those activities. 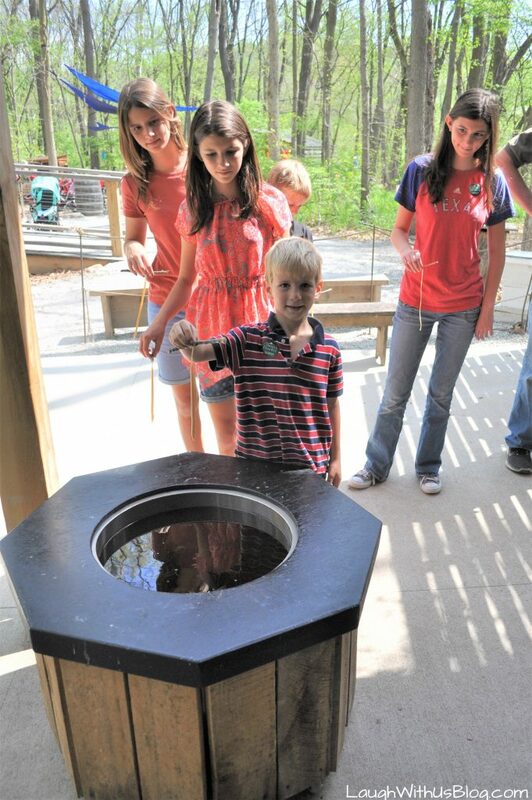 It looks like your family had so much fun at Conner Prairie! I bet my family would love to check it out someday.